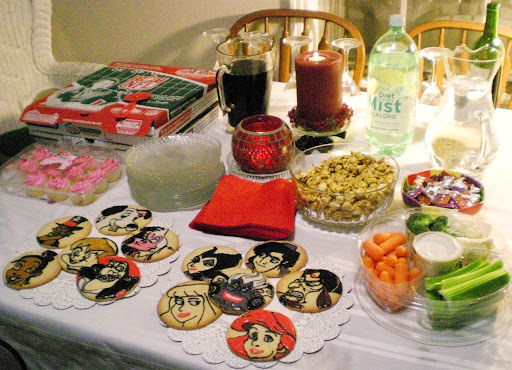 A friend and her family celebrate a mid-February holiday called Archenemy Day. It's a little bit Anti-Valentine's Day and a little bit Thanksgiving. The premise of Archenemy Day is that Valentine's Day is unnecessary because, as her sister put it, "You should celebrate the people you love every day of the year. On the other hand, there isn't a day to celebrate your enemies." Therefore, Archenemy Day was created. On Archenemy Day, party guests briefly and civilly describe the situation behind their archenemy-of-the-year and, whenever possible, do so in a way that will allow the foe to remain anonymous. The point is not to hold a ranting session, but to focus on the lessons you learn from dealing with archenemies. Some themes arise. Our archenemies make us feel like muck and disrupt our lives but they also tend to make us more empathetic, patient, and conscientious people. When we examine our archenemies, we examine our own behavior and consider how it affects those around us. And, like that famous town in the Southwest, what happens on Archenemy Day stays on Archenemy Day. 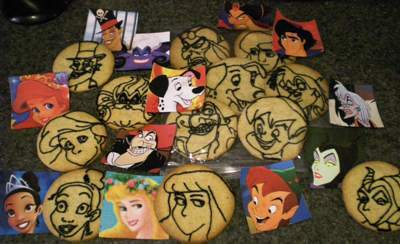 This year I decided to make cookies for the party. 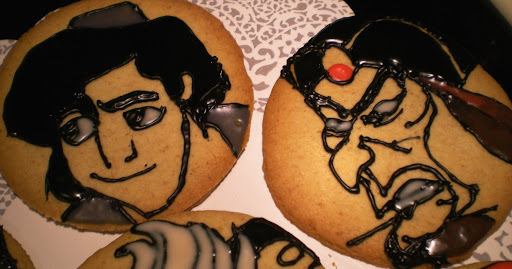 Ever since I worked on the Star Wars cookies a few weeks ago, I've been eagerly awaiting my next opportunity to play with—er, enhance my skills in royal icing. To decorate the cookies, I printed a dozen reference photos and piped in the black outlines. Captain Hook was my favorite. When the outlines were dry, I flooded the resulting 'cells' with color. For the cookies, I researched a few different recipes (including the one Kelly used for the Star Wars Cookies) in order to come up with my own. I discovered that most of the top sugar cookie recipes are very similar to each other, only differing by half a cup of flour or an egg or so. So, geek that I am, I used an old gadget shopping trick and looked to the negative comments associated with each recipe. While positive comments like, "I love these cookies!" or "They turned out really well!" may be more enjoyable to read, they don't tend to offer useful baking insights like, "They were too dry and needed more butter." As with archenemies, we often learn more from our detractors than we do from our allies. Bake at 365 degrees Fahrenheit for 12+ minutes. The cookies are done when they just barely start to turn golden. Note: Unless you like very dry, crisp sugar cookies, bag them along with a slice of bread once they have cooled. These cookies tend to dry very quickly and thoroughly; the moisture in the bread will keep them soft and moist. Remove the bread as soon as the cookies have reached optimal moistness or the cookies will begin to taste like the bread. I used vanilla instead of almond extract. I didn't have any corn syrup on hand, so I made my own. 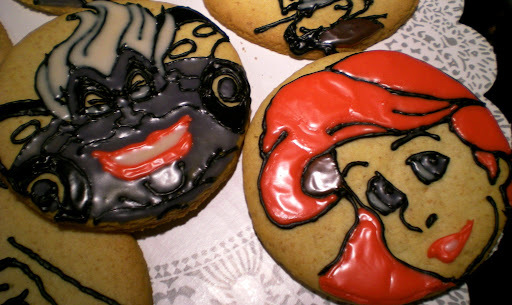 If you plan on icing as many cookies as I did, I'd recommend doubling the icing recipe. Postmortem says: It's far better to have too much icing than not enough! If you were in a Disney movie, who would your archenemy be? These are lovely! 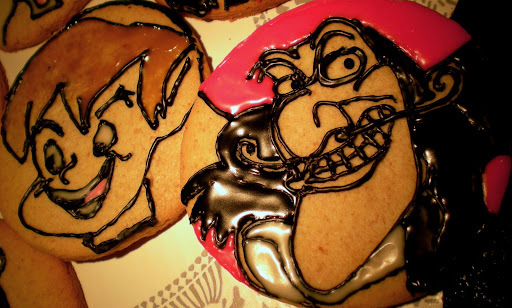 I'm jealous of your mad cookie-decorating skills. Also, I'm making my own corn syrup from now on! As soon as the tiny but I have is gone, that is, which may take nearly forever. I've noticed that making enemies or falling out with friends allows me to see my own worst qualities as well. Interesting that you should point out something similar. The thing to know about the make-your-own corn syrup is that any leftover syrup you end up with will crystallize pretty soon after it has cooled down, although this didn't happen to the icing itself. The syrup can probably be heated back up by soaking its container in very warm water (like you do with old honey), but it might just be easier in the long run to buy the real stuff. The make-your-own corn syrup that I saved did re-liquefy when I boiled the bottle it was in, but it took prolonged heat and some enthusiastic ice pick-like mashing with a spare chopstick to get it back to that state.